Here's another card I created with the April/11 Art Freckles card kit. 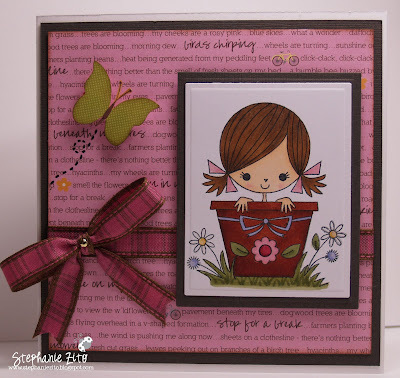 I used the adorable Florence the Flower Pot Girl from Stamping Bella. Products used: Bazzill and Neenah cs, Jillibean Soup dp, TPC gems, Distress and Memento ink, Copic Markers and Atyou Spica pens, black Identi-Pen, Nestabilities and Bazzill ribbon. How cute is she! What a lovely card Steph - great layout and colour combo's! Beautiful! Awe she's is so sweet. Love this card.